This Environment Day, the world could finally and unanimously convince itself to go Plastic Free. The good thing is, we have somehow managed to acknowledge the elephant in the room, quite literally, given its expanse and impact. The widely accepted fact that every single piece of plastic ever made, still exists, is enough to suggest that plastics have taken over the world. In fact, data suggests, enough plastic is thrown away each year to circle the earth four times. The magnitude of the situation looks bleak and grim. The root cause of the problem seems to be our buying and consumption behavior. In fact, over the last ten years we have produced more plastic than during the whole of the last century while 50 percent of the plastic we use, is used just once and thrown away. 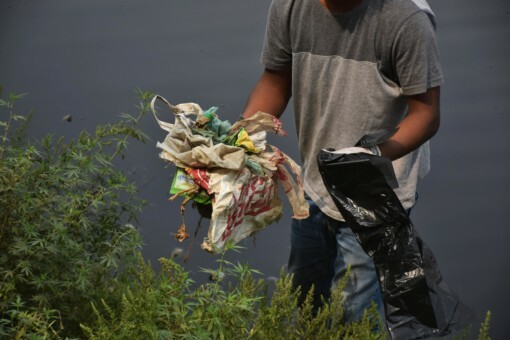 While most of the efforts emphasize on solving the issue by addressing this consumer behavior, the role of simultaneously regulating the production of new single use plastic will play a vital role in our fight against plastic pollution. 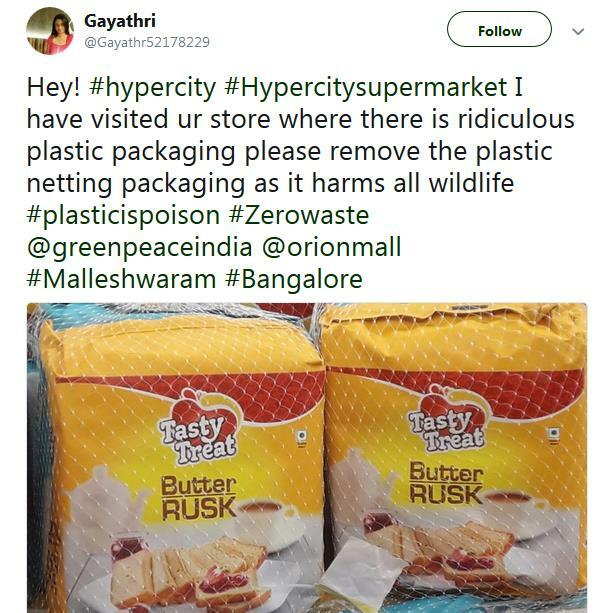 Greenpeace India volunteers have been campaigning over the past few days in Bangalore to make big retailers realize this grave issue and their massive contribution towards escalating it further. 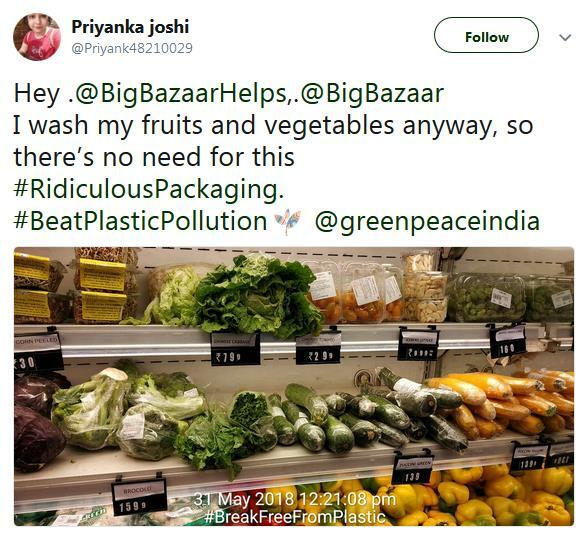 They have been posting on their twitter accounts, raising concerns with regards to one of the most rampant, unmindful and unnecessary ways of inflating the issue of plastic pollution further – Unsustainable Packaging; spotted in the respective retail super-giants. Companies, in the pursuit of placing their product, above all their respective competitors, often indulge in packaging gimmicks which are highly irrational and unessential. How does one know? It’s easy, you know it as soon as you spot it! In a market full of tough competition and immense opportunities, companies go berserk with their branding and product positioning. One key aspect is its packaging and its look and feel. This is done in the quest to create a niche for the product and to make it stand out in the midst of multiple variants/brands. 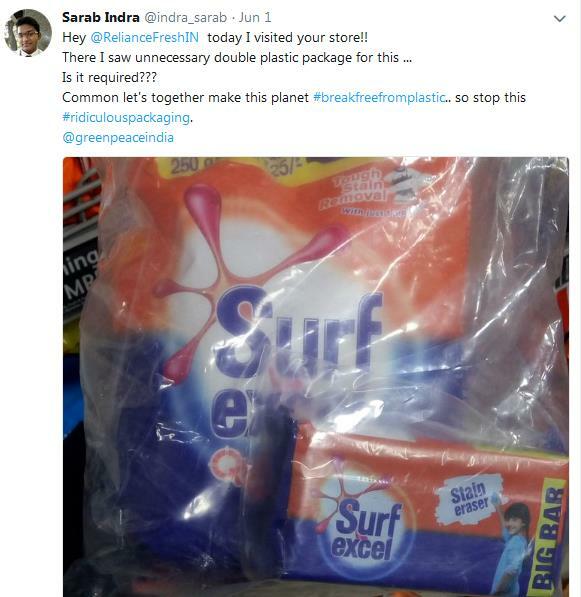 The quest for profits and market capture has resulted in a massive investment into product packaging over the last few years resulting the issue of plastic pollution to be aggravated to this level. Plastics, in the form of packaging, have now become the basis of brand positioning and a newly built customer relationship and loyalty around it. They are an epitome of brand superiority and an evolved product choice. Let us try to understand it a bit further. How often do we realize the role of packaging in consumer choices and buying behavior that we may ourselves exhibit? We live in an era of perceptions; and for sure they are not limited to be deceiving but, as in this case, are detrimental too. How often do we make smart choices based on composition, source and its impact on our environment when we pick up something from a supermarket shelf? We are driven by tendencies that are meant to encourage us, like others, even we fall for perceptions created by manufacturers and dealers. And you may agree we are helpless. While, as smarter than before consumers, we may slowly drag ourselves towards the path of course correction, the hefty onus for limiting plastics in our supply chain to minimal, subsequently lies with the manufacturers, producers and most importantly regulators. We have a crucial, dual role to play in this fight towards curbing plastic pollution. First and foremost we need to tame our consumption behavior so as to minimize the contribution of our choices to the world’s plastic woes; and the next step being – holding companies and manufacturers accountable and guilty for generating massive plastic waste and compelling them towards sustainable alternatives. 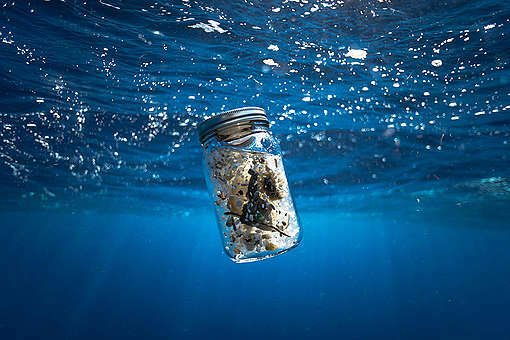 Imagining an era free of plastic pollution may look difficult given the extent of the issue and our enhanced dependencies, but is not an impossible feat to achieve. Together, with small steps of cumulative and collaborative actions, we may be able to define and shape our future. My childhood was plastic free and I hope for plastic free future. We have to take responsibility and force retailers. Stop buying stuff in plastic packaging. Thing twice before you buy plastic bottles. What about carrying a steel glass or a glass bottles. Didn't we survive with those until just 10 years ago. Absolutely Sam, each one of us have the responsibility to get the retailers on this side. 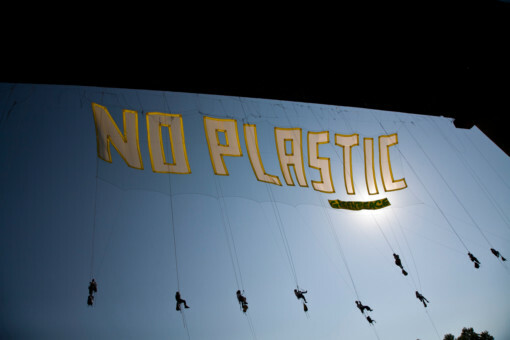 Unless the demand is managed, supply will flow, and with a collective statement we can create a wave of non plastic consumption. Thank you for reading and commenting. When will people realize that plastics are harmful to their health, besides harming the environment? They must discard the use of plastics before it is too late ! Yes! Right! No plastic anymore! A poor young whale stranded in Thailand, dying in agony with 80 plastic bags in its stomach! Dying of starvation with a full stomach! We are choking in plastic! Where are all the good glassbottles gone that can be recycled endless times!!??? PLASTIC IS NOT GOOD FOR DAMAGE OUR ENVIRONMENT. STOP PLASTIC PACKAGING ON EACH PRODUCTS AND CAN USE CLOTH PACKAGING ON EACH PRODUCTS FOR RECOVER. I personally feel that it is our mindset,how seriously you take the burning problem and understand its consequences on every living things and how much you hold yourself responsible for this crisis. To do our bit to make the earth healthy and greener to live in we can intentionally and conditionally make sincere,serious and conscious efforts to change all the above mentioned variables.GOOD LUCK TO ALL OF US TO ACHIEVE OUR GOAL. It is good to avoid plastics. But let us find alternatives. Everyone should carry a cloth bag when we go to purchase things. Or else let the shop keeper demand payment for cotton bags so that plastics use can be reduced. Moreover we have to think of biodegradable plastics or plastics that can be recycled or used for energy production. Most of the package is for food. Making a habit of having fresh and home made food brings a big difference. Some 15 years back when there are no super markets, the grains, flours and other groceries used to be weighed and packed in paper by retailers. If someone remember, the cream biscuits used to be packed in paper boxes. We have lived a comfortable and peaceful lives without all these things! We can even now if we wish to. Each one of us must take a keen decision to not to use PLASTICS and motivate our fellow workers about the consequences of using plastics.We can go for eco-friendly methods to carry our things. Using reusable and recyclable items would also help to minimize the mater only when we follow the procedures.. There must be a compulsory awareness session in classes from LKG onwards..Since Plastics are not such a material which we can avoid fully, but limitation can be made possible. Let us hope for the best. My simple question is are Greenpeace volunteers buying those irresponsibly packaged products for their personal use. 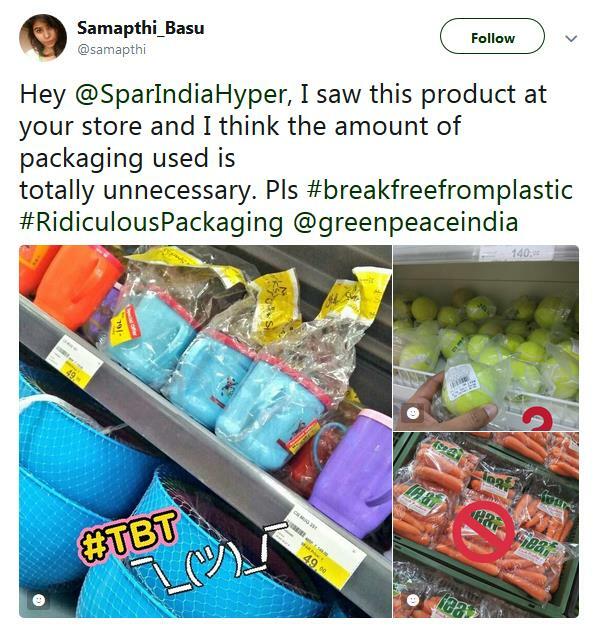 If yes this whole campaign thing seems farce and if No, then I would suggest that please buy the products but remove all the unnecessary plastic right there and hand it over to the cashier. Thank you for writing. 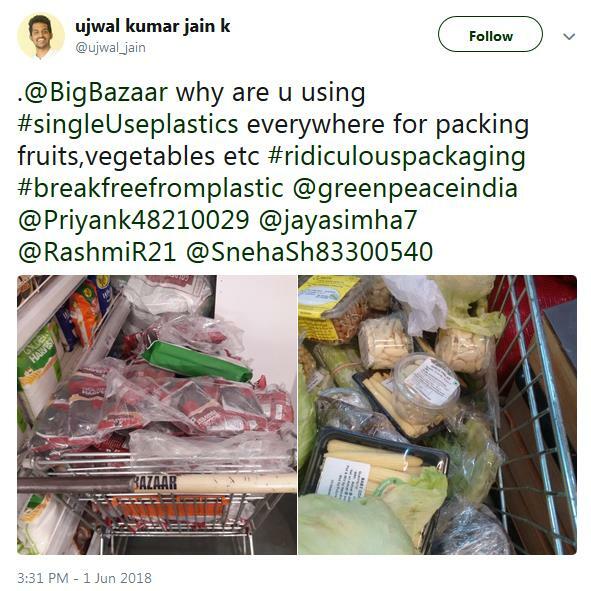 No, the volunteers weren't there to purchase the products but to highlight the unmindful packaging practices of the retailers. 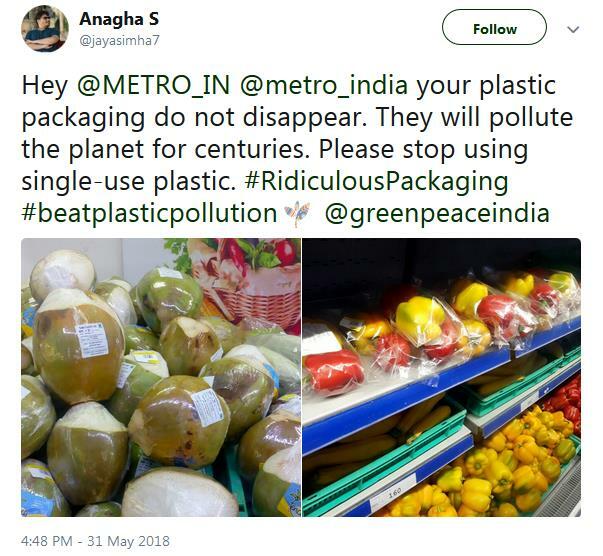 plastic free india or whole world is imagination if all people do this then imagine becomes real life. now imaging world without plastic. tomorrow may be or not success but try until succeed .